HARTFORD — The Connecticut General Assembly Conservative Caucus today announced highlights of its 2019-2020 legislative agenda, including provisions that would strengthen Connecticut’s criminal justice system, uphold individual voting rights, and allow individual workers to determine their contributions to union activities, among other proposed legislation. In response to the repeated and detrimental loosening of the state’s criminal justice laws, the caucus proposed legislation to reinstate the death penalty to hold violent offenders accountable if they choose to commit heinous crimes towards the people of our state. The legislation’s focus on capital felony cases would not otherwise impact state law regarding prosecution or imprisonment for lower level crimes and would allow the imposition of the death penalty in certain specific and violent cases. “In recent years, the concerted and systematic repeal of laws that are designed to keep our citizens safe is a serious concern and by reinstating the death penalty for capital felony cases we can protect the public and hold criminals accountable for their actions,” Rep. Gale Mastrofrancesco said. The Conservative Caucus also supports reinstating funding for the Department of Emergency Services and Public Protection’s (DESPP) state-wide Firearms Trafficking Task Force that was allowed to lapse by former Governor Malloy. Established in 2000 and overseen by a policy board, the Firearms Trafficking Task Force was set up to “investigate illegal gun transfers, possession, and transportation and trace guns that law enforcement authorities seize.” Unfortunately, that program was put on the backburner in recent years. Protecting the individual rights of each and every citizen remains a strong focus of the Conservative Caucus which is why they’re also proposing legislation to require state and municipal collective bargaining agreements to include clear, concise language to notify members of their right to opt out of union membership. Another important issue for the Conservative Caucus this session is preserving each citizen’s right to cast their ballot for a candidate of their choice in federal elections. Caucus members proposed legislation to remove Connecticut from the small list of states that recently joined the National Popular Vote Law movement. That law, signed by former Governor Malloy in 2018, forces Connecticut representatives in the Electoral College to cast their ballots in favor of whichever presidential candidate garnered the most popular votes nationally. “In essence, with the law passed in 2018, Connecticut is poised to give up its voice to elect the president to other more populous areas of the country,” Rep. David T. Wilson said. “That was a tremendous mistake that needs to be rectified before it becomes a national issue. I’ve heard from many constituents who are opposed to this legislation. Why people in a small state like Connecticut would willingly give up their voice in electing national leaders makes no sense. Rewriting the U.S. Constitution at the state level is a recipe for disaster. The Conservative Caucus also proposed legislation regarding work requirements for certain benefit programs, expansion of school choice and prohibition of local firearms ordinances. 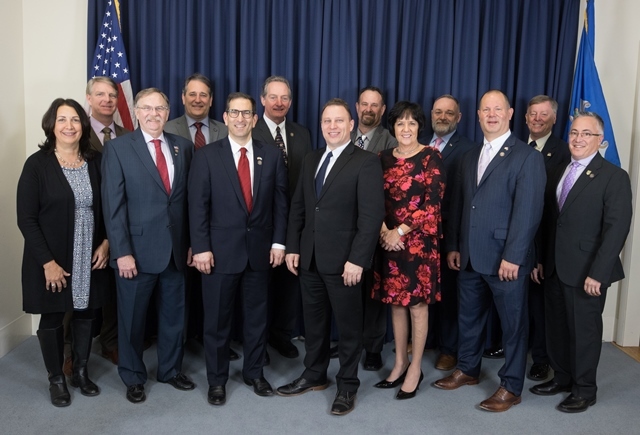 The Connecticut General Assembly Conservative Caucus is a group of Connecticut legislators dedicated to the principles of limited government, economic freedom, and individual liberty. Its members foster open debate about the role of government in society, adherence to the Constitution, and the rule of law. They propose and advocate for legislation that promotes the freedoms, individual rights, and prosperity of all Americans. The members of the Conservative Caucus are: Rep. Mike France, Chair (R-42); Rep. Craig Fishbein, Vice Chair (R-90); Rep. Anne Dauphinais, Secretary (R-44); Rep. David T. Wilson, Treasurer (R-66); Senator Rob Sampson (R-16); Rep. Tim Ackert (R-8); Rep. Doug Dubitsky (R-47); Rep. Rick Hayes (R‑51); Rep. Kurt Vail (R-52); Rep. John Piscopo (R-76); Rep. Gale Mastrofrancesco (R-80); Rep. John Fusco (R-81); and Rep. Vincent Candelora (R-86).